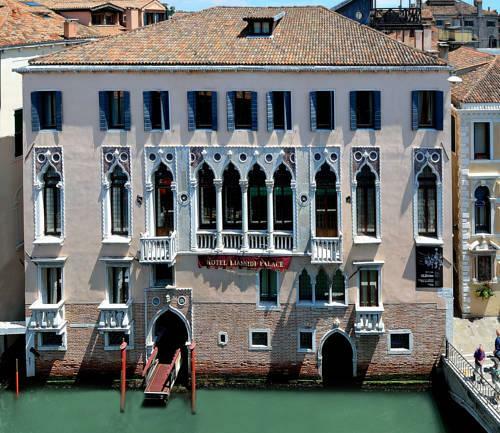 It’s not so simple to stand from hundreds of hotels in Venice, but Liassidi Palace has managed to do that because of its unique design. It’s a true paragon of the classy Venetian style. Travelers will fall in love with spacious guest rooms made primarily in cream shades. They feature large beds with high carved headboards and fabulous armchairs with burgundy upholstery. On the floor, there are bright carpets with intricate patterns, and walls are decorated with beautiful paintings by famous Venetian artists. The building of the hotel dates back to the 15th century, so it’s a wonderful example of gothic style. The comfortable Hotel Alcyone is also open in a beautiful old building, but its design is very creative and modern. The abundance of glass and mirror elements remains the main peculiarity of Hotel Alcyone. Thanks to a unique lighting system, the hotel looks nothing but impressive. There is magnificent soft furniture in art deco style in the hall, while the state of art lighting system adds special charm to the place. Guest rooms are mostly made in crimson and violet. They look very spacious thanks to large mirrors. Fans of modern luxury will be very impressed with the design of service of Carnival Palace . Guest rooms of this hotel are made in different styles and color combinations, but all of them feature premium textiles and gorgeous furniture in Venetian style. In some guest rooms, there is a giant wooden bed in the colonial style, while designer lamps and chandeliers in black create a truly inimitable look. The high-class hotel has a wonderful adjusting territory that comes with a charming inner yard and spacious summer terraces. 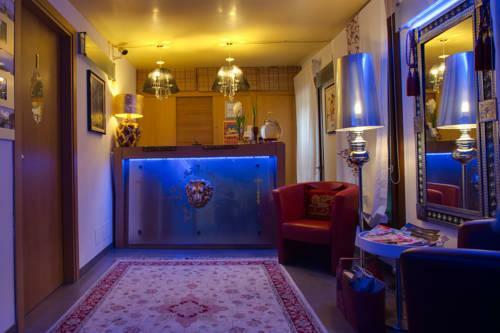 B&B Bloom Settimo Cielo is one of the most stylish and colorful budget hotels in Venice. The miniature hotel offers only 6 guest rooms with individual design. There is an incredibly romantic room in the shades of lilac with the historic wooden ceiling and an aristocratic guest room with the interior made in cherry colors. Romantic travelers will be in love with the room with lots of pink satin textiles. There is even a guest room in cream shades with fragments of original stone walls. To the service of guests, the hotel offers a wonderful panoramic terrace on the roof of the building. Unusual designer approach to interiors is a calling card of another hotel, Locanda Antico Casin . It is open in a beautiful building that dates back to the 18th century. Its guest rooms are made in different styles in accordance with modern trends. The most unusual guest rooms are located on the top floor. They have wooden mansard ceiling. In order to reach their rooms, tourists will need to go up the transparent stairs. While walking, they will see colorful installations and mirrors of unusual shapes. In the evening, magnificent artistic lighting makes the hotel’s hall and corridors even more attractive. The incredible design in Baroque style is a striking peculiarity of the high-class Ca Alvise . Guest rooms look incredible with fabulous furniture that is worth a king’s palace and giant chandeliers in retro style. Gorgeous heavy curtains create even a more solemn atmosphere. The hotel’s hall is a wonderful place where travelers will be able to admire an interesting collection of old statuettes and paintings. The restaurant looks stunning with colorful stained glass windows and wall panels with ancient coat of arms. Ca Alvise is an incredibly aristocratic and romantic place, so there’s no wonder why it’s so popular with couples. 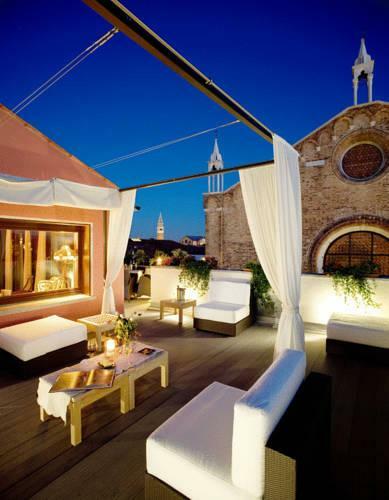 This guide to most stylish hotels of Venice is protected by the copyright law. You can re-publish this content with mandatory attribution: direct and active hyperlink to www.orangesmile.com.